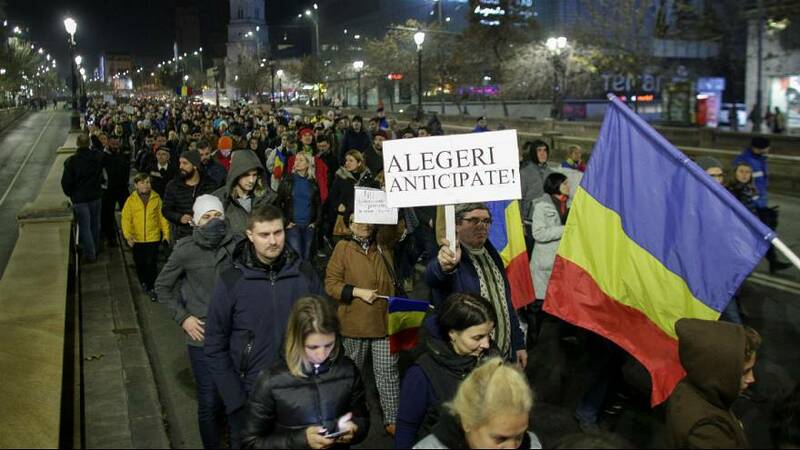 Protesters were back on Romania’s streets in their thousands on Sunday – this time defending what they see as an attack on judicial independence. MPs are currently debating plans by the ruling Social Democrats that could see the judicial system put under political control. It comes after the country had its biggest protests since the 1989 revolution earlier this year after the government tried to push through a law to decriminalise some graft offences that would have let those convicted of corruption – including politicians – off the hook. Sunday’s demonstrations saw 12,000 people on the streets of the capital Bucharest, according to police sources, and thousands elsewhere in the country. “I cannot remain passive in front of this attempt to undermine the independence of the judiciary,” Oana, a 35-year-old doctor told AFP news agency. The proposals would see reducing the responsibility of Romania’s National Anti-Corruption Directorate (DNA) and stop it from being able to investigate magistrates. At the same time, the Ministry of Justice would have more control of prosecutors. Romania, one of the most corrupt countries in the European Union, has made strides in tackling the problem in recent years. The DNA has been praised for leading the crackdown and a survey found 60 percent of Romanians trusted the institution.